Children International has partnered with Turning Point: A Community Resource of The University of Kansas Health System to implement a curriculum that teaches kids how to be resilient and maintain good mental health. A group of kids work on an activity to help them learn how to self-calm. Caregivers involved in the test of the curriculum reported that their children had less anxiety and depression after completing the course. Depression, anxiety and stress are issues that can affect anyone regardless of their socioeconomic status. However, kids in poverty are particularly vulnerable given the adversity they face on a daily basis. 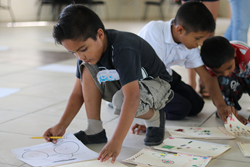 Identifying this concern, Children International has partnered with Turning Point: A Community Resource of The University of Kansas Health System to implement a curriculum that teaches kids how to be resilient and maintain good mental health. For more information about Turning Point, turningpointkc.org.